The OptoSigma 123-0345 65mm Aluminum XY Side Drive Stage is a Crossed-Roller Bearing stage which offers higher load capacity and better precision than a regular ball bearing stage. This stage is 40mm tall and is a metric stage- the top plate having nine M6 holes on one-inch centers. 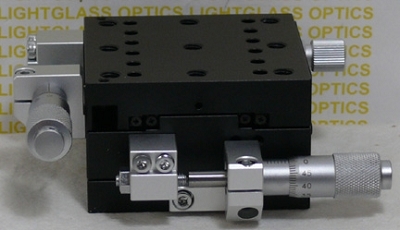 The OptoSigma micrometer actuators are included.